You’ve been asked to attend a work-related event. It’s a biggie. Anywhere from dozens to hundreds of people will be there. Whether it’s an internal gathering or an external conference/trade show, it’s a grand chance to meet new contacts. But there’ll be pressure on you to make a solid impression. Seem like an intimidating task? Entering a large room filled with strangers – especially when these people can make a difference in your career – is daunting. The ability to initiate and sustain conversations is key. With a bit of preparation you can work the room without over-stressing. Find out the nature of this event in advance. Will it be formal and tightly scheduled? Or more casual with plenty of time for informal meetings. Who will be there? What’s the dress code? Learning about these details in advance helps you prepare for networking. Face-to-face schmoozing is very much a spoken experience. The more you know about the event (e.g. its theme, who the hosts and speakers will be), the better you can ready yourself to hold relevant conversations. Every large event is an opportunity for takeaways. You should know beforehand what it is you want to achieve while there. Possibly you’re hoping to get noticed by a just few key people. If you can establish a relationship with several of these contacts, they may be able to open doors for you in the future. To make this happen you’ll need to become a conference commando. Then again this might be the time to say hello to as many people as possible. It depends if you’re objective is to establish your presence and collect a whole bunch of business cards. 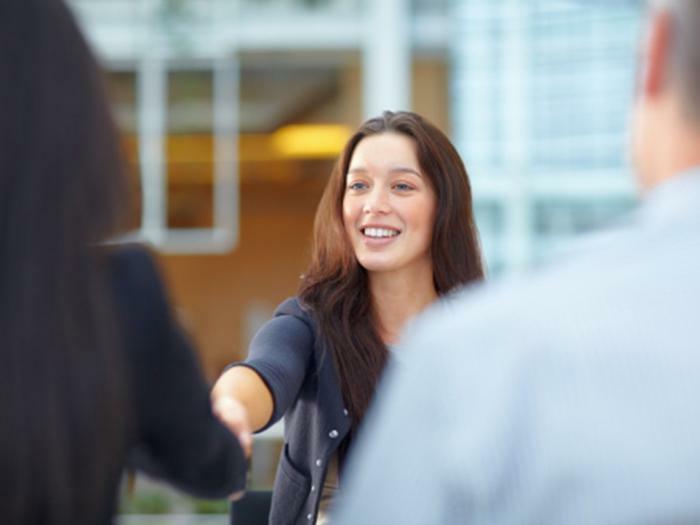 Were you ever formally trained on how to introduce yourself at a business event? By now you’ve likely got your 30 second “elevator intro” down pat – where you give your name, title, area of expertise, and add a choice accomplishment or two. Yet at a conference or company event, it can take as little as “Hi, my name is (your name here)” to get started. The other person will likely state their name (even though it may be in huge letters on their nametag), possibly their title and company too. Now you reply in kind. No need to brag about yourself yet. First you establish a basic rapport. Demonstrate your interest in knowing about the person by asking some simple questions. At a conference, you can say: Have you been to this event before? Did it take you long to get here today? What have you seen so far that’s caught your interest? For company events: What department do you work in? Do you know so-and-so? Who do you report to? How long have you worked here? If you’re the person who’s initiated a conversation, you’re expected to sustain it. So have a quiver of discussion tidbits at your ready. For conferences, read up beforehand on the main subjects being discussed. Yes, you’re at the event to learn more from the experts. But showing up with some knowledge lets you chat about the topics without appearing uninformed. At company events, be aware of the important issues your company is dealing with. No need to be a specialist on every department or role’s specific concerns. You’ll try to tease out from your fellow conversationalist(s) by asking how their projects tie in to your employer’s overall strategy. Each dialogue you have is like a mini information interview. Treat it that way. Part of being sincere and making a good impression is how you follow through. If you tell someone you’ll contact them, do so. If you promise to send them some information or the name of a possible contact, get it done quickly. Making a second impression is as important as that initial image you worked hard to create. All that conversation you generated, and the goodwill that comes from it, can be leveraged. Build relationships a step at a time. Make the most of working that large room: it’s your ticket to a wider base of career contacts.